Passport to Dreams Old & New: So You Bought A New Land, Eh? So You Bought A New Land, Eh? Way back in April I posted a little number discussing the much-maligned Florida Fantasyland: where it has been, where it was, where it was going, where it could go. Reading the article now seems almost quaint as I, and others in the community, were under the operating assumption that the construction bid that had just recently then gone out for the "Little Mermaid attraction" was for a single show element plopped down across from Pooh, probably merging in the old Ariel's Grotto meet and greet which was installed there in the 1990's. When a certain famous blueprint was leaked to the internet in mid-July, the game plan changed significantly. Although Mermaid is indeed the only "ride" in the ambitious Fantasyland overhaul, it came with a potpurri of crazy ambitious ideas, fairytale chalets, castles, restaurants... it was just staggering. It was also, probably, fake. Although I went into berserk fangirl mode (kinda like this) when I saw the plans, my Disney-dar was set on 'cynical', as the company has trained me to do since 1998. But I held out one tiny little grain of hope above all others which was only possible because of my years working at the Magic Kinghdom: these plans had *too good* of an idea as to what was actually back behind that stupid little hill we've been living with for five years. The blueprints not only pushed as far back as the access road - something a Disney fan fabrication wasn't likely to take into account - but bothered to relocate all the Maintenance trailers which currently dot the sloping green field which lies where giant squid once lurked. That spoke of something cooked up by somebody who was working with practical realities instead of fangirl fantasies, so it was at least to some degree real. But how real was it? Would this be the 21st century's Thunder Mesa? I don't need to tell you the happy ending of that question of course. What's funny is that at the end of my Fantasyland article I posited that whatever was coming to Florida wouldn't be as ambitious as what California got back in 1983. The funny thing is, I was wrong. It may not be a whole lock, stock, and barrel remake, but it's certainly as ambitious and it doesn't require all of Fantasyland to close - so both we and management win. I also complained about the pitiful state of the Skyway buildings in that article, and now the Tomorrowland one has been almost leveled. A lot changes in five months. One of the funny things about this remake is that it actually addresses two of my biggest suggestions from the April article: that the Fantasyland alternations establish a stronger sense of place and environment, and that a lot of water be added. I'm happy to say, both have been addressed. 1) PLACE - This new version of Fantasyland will add a number of very interesting, very complex visual / conceptual shadings that I'm not sure we'll be able to fully appreciate in person until the whole thing is ready. In 2012 you'll be able to enter the Magic Kingdom, walk up Main Street, and see Cinderella Castle. Stepping through the castle, you'll be in the Medieval courtyard of today, which Dorthea Redmond's beautiful fairytale village. But past the carousel, the courtyard will end, and you'll step out of the castle's walls and into a pastoral, European countryside. Directly in front of you? Cinderella's house, rising in classical French splendor (how much of this park does this scullery maid own?!). You can actually not only go directly up to the house, but enter it, walk into something that I'm sure will look just like the Villa from the movie, and Cinderella and her step sisters will greet you. The world of possibilities of the Magic Kingdom multiplies. This new Fantasyland works in layers, just like the old invented word I throw around - Stratification. The layers of complexity here continue to stagger me. I talked a bit about how Fantasyland suffers from having no back "wall", and WDI has seemingly answered my call for a wall.. literally. I think it's brilliant. Screening out the tournament tent styling of the 1971 work from what I'm sure will be very complex, detailed 2012 work is really the most brilliant thing about this project, creating a dynamic between castle walls / countryside fairly similar to the civilization / wilderness dynamic which informs much of the Magic Kingdom's west side and makes those areas seem so rich. The fact that nearly every castle and house you'll see in this countryside is an experience that you can enter and enjoy just compounds the feeling of being able to go off into this world forever. Huge kudos to Imagineering for this. 2) WATER - I'm always harping about water, but it's true that Imagineering has ruined much careful WED work by just plain old paving over water. From minor things like the reflection pond at the Walt Disney World Village, to dismantling fountains all across Adventureland in 2000, or the wholesale removal of Communicore Central's ponds and lakes which greatly softened the impersonal feeling of that area's "monumental" architecture, water removal at Disney just drives me nuts. I'm happy to finally see some water returning to the fold. Water will cascade down the front of the Little Mermaid show building and form a lake bisected with bridges. Water will flow from the mountain cloaking the Beast's castle and become rivers and streams by Belle's house and Cinderella's chateau. There will even be a fountain in the center of Belle's village. It's great. 1) DON'T SKIMP ON THE LANDSCAPE! This seems like a no brainer but frankly Disney's landscaping in Florida has taken a huge nosedive in the past fifteen years. Everywhere flowers have been eliminated in favor of sturdy year-round, low cost plants which sometimes have some color in them, but often not. Areas which once had rolling greens and carefully trimmed landscape areas have become sandy, weedy messes, full of dead leaves for ground cover. This is especially true around the Rivers of America and the train tracks, where Disney seems to have said "It's the wilderness! Stop taking care of it!" and left behind the carefully coordinated landscape plan of old. The Haunted Mansion has been so boxed in by hedges, weeds, trees and other green debris that you can hardly see it. The only Florida park which still displays competent landscaping and floral arrangements is EPCOT, which as ever seems to exist in a graced state even as her attractions are slowly stripped of their charm and relevance. So I say to WDI: don't skimp on the landscape. If the whole thing is going to work, we need to see Belle's house cozily tucked amidst the rolling hills of the French countryside. Aurora's hidden cottage needs to be in a real forest, not a cluster of saplings we'd expect to find in the parking lot of a new Target. The environment needs to look grown in and lived in when it opens, not ten years later. Disney needs to start searching for and relocating mature trees now, not later. The girl will be there. The bridge will be there. The house will be there. But will the tree be there? 2) USE A VARIETY OF MATERIALS! The Magic Kingdom overflows with textures, colors and tones, whereas much of Disney's structural work in the past fifteen years has been stucco and rock, which is why I think this point is essential. 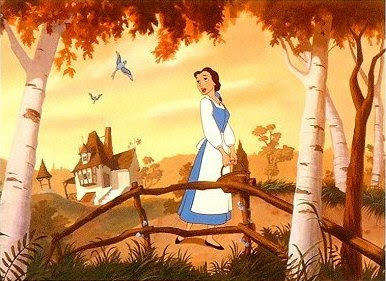 Belle's house shouldn't be a sculpted block of concrete, but clapboard, siding, shingles and so on. While sculpted concrete and lath ages great and is low-maintenance, that isn't the way Disney did things in the 1970's and if all this new stuff doesn't seem like it was there all along and we just never noticed it then it's gonna be pretty awkward. Neither should the new areas be painted garishly and brightly: let the natural materials used tell the story in colors. It'll last even longer than throwing latex paint over a grey concrete shell and look better, to boot. 3) DON'T SKIMP ON THE OTHER STUFF! I have no doubt that with their $300 million, all of the departments bringing this thing to life will perform their roles faultlessly. The special effects in the Little Mermaid will look wonderful. The set dressing inside the Princess "houses" will be beautiful and perfect. The pavement will be themed. The speakers will be hidden. This is a huge effort on the part of WDI - something on the scale which Florida hasn't seen in the past ten years - and all the stuff that is budgeted, assigned and planned will be great. But there's still a few things that can easily fall through the cracks. 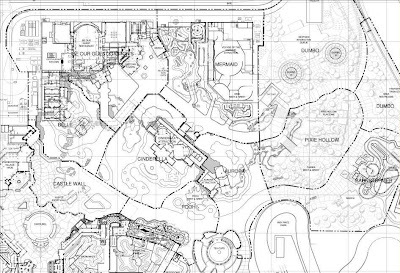 The Pixie Hollow area has been moved to a nebulous "Phase Two" which means, in Florida, that it will never be built. As much as I'd like to see the Pooh playground torn out, it will remain, with a character greeting area just behind it. Let's not forget to take this opportunity to improve the existing playground and not forget to refurbish the facade of the adjacent attraction into something better themed. Let's also not forget that although the main Fantasyland courtyard is expected to remain untouched that it's never too late to add details, textures, and colors to the remaining upper areas of the 1971 Fantasyland facades which are still rather spartan. 1971 minimalism clashing with 2010 detail fetishism isn't going to be a pretty sight, so it's best to take this time to fix up those remaining facades. I don't just hope or these things; I fully expect them. That's a reported price tag of $300 million; that's 25 Hall of Presidents refurbishments and 3 Expedition Everests for an area with two low key rides, two eateries, a few shops, a train station and four character-greeting-walkthrough-things. Although Fantasyland the Second won't reverse every negative change in the Magic Kingdom for the last decade, nor will it probably even affect the front gate's profit ratio, that is exactly what is so admirable about it. Disney doesn't need to try to make money on the Magic Kingdom; people have been steadily coming since it opened and will keep coming as long as it exists. But a glaring problem has been identified, a suitable plan has been hatched and supposedly money will be put towards correcting a long-standing mistake. It hasn't been an easy two decades for Fantasyland. Two of her three most visually striking elements have been removed and her role as the sole domain of the Disney classics has been confused as every corner of the Magic Kingdom has been "synergized". If we say that the closure of 20,000 Leagues Under the Sea was day one of the ramp-up to this new version of Fantasyland, it's taken Disney some fifteen years to even announce a replacement for this neglected area of their flagship Florida park. I don't doubt that the result will be impressive. I look forward to it immensely. But it's a hard trick to pull off and now, more than ever, as the Disney faithful will be at their most discriminating, now is the time to make sure that everything is exactly as it should be. Being the Magic Kingdom isn't easy. Great article. However you're off by a couple decimal points on your figures for marvel acquisitions. I agree with your thoughts and commentaries on Fantasyland. People tend to forget how revolutionary Fantasyland the First was compared to the Disneyland's Fantasyland. It has almost become a platitude to berate what we have in Florida. In this case, it is worthwhile and we can hope that Imagineering will be able to fight the good fight and persevere with the plans. Wow, what an awesome article. I totally agree with you thoughts on the new Fantasyland. Thanks for sharing your thoughts, your articles are always amazing. As John stated...the Marvel acquisition wasn't Four Million dollars...it was FOUR BILLION DOLLARS! They couldn't have gotten just Spider-Man, never mind the rest of Marvel, for only Four Million (considering that's less than the cost of a single movie). Just a great article! I share you rinsights, enthusiasm for the project and concern they'll follow through. Please write more often. This is the best Disney related content on the web. I'm wishing some of that money goes to improving the facades inside the castle wall. Otherwise the transition from fantasyland to fantasy forest will be even more jarring. Great piece- here's an excerpt from one I wrote about trees at the MK. Walt Disney World is a place that inspires and enlightens, so much so that visits to WDW refresh and invigorate guests. It is easy to understand why guests become attached to attractions, shops, and resorts. But Disney parks are not museums; they are living, breathing entities that "will never be complete “as long as there is imagination left in the world.” But Walt also said that “even the trees will grow; the place will get more beautiful each year.” These quiet areas of understated beauty live on in the imaginations of guests long after they return home. John Hench wrote that “Imagineers carefully select images essential to each story [they] want to tell in a Disney park.” Disney guests “engage in a special world of story” when they enter the parks; they feel immersed “within the special world that [Imagineering] created” (Hench). No place is that more evident than in the Magic Kingdom where subtle visual clues lead to smooth transitions from one land to another. Imagine, then, the shock of a "hubless" Magic Kingdom. Imagineers conceived the Hub as a “design solution to accommodate guests’ decision making” (Hench). That leafy oasis of shade surrounded by inviting park benches offered tantalizing views into the other lands of the Magic Kingdom. It also provided a gathering place complete with ample seating and much needed shade. “Just like Walt did,” the Imagineer “assumes the guests’ point of view . . . tak[ing] the guests’ interests to heart and defend[ing] them when others didn’t think that it mattered” (Hench). The Hub in its original form fulfilled this promise. A 1982 WDW souvenir book devotes three pages to what it calls “the miracle of the Hub.” What is so special about this area of the Park? In addition to the practicality of providing “easy access to all areas of the Magic Kingdom,” the Hub provides a “sense of continuity." The goal of the Imagineers was to ensure that “all the elements within a land work together to create a smooth and constant chain of events” (Hench). This was provided by the greenery of the Hub, a visual break making transitions into each land smooth and seamless. Without the Hub,“visual details disagree” so “guests experience active clutter” (Hench". Neon lights are now visible from the riverboat; the angular buildings of Tomorrowland are visible from Main Street. The actual perspective of Main Street is ruined. The hub provided a leafy transition from MS to the castle. The “forced perspective [of Main Street], combined with the depth of the Hub beyond the end of the street, opens up a vast and exhilarating vista to the guest entering the park” (WDI Field Guide). Without those trees, Main Street looks much smaller; the castle loses much of its mystique. It feels as if the castle has been pulled towards the front of the park. Instead of a far away portal to a land of enchantment, it's been reduced to an immense stone structure from Europe plopped down at the end of a very American street. This “mixed message sets up conflicts [and] creates tension” (Hench); the sense of balance and proportion is so altered that approaching this lovely castle is no longer inviting or suspenseful. The loss of the hub violates the time-honored hallmark of WDI design that “each land relates to others in a noncompetitive way - contradictions that would intrude upon what the story seeks to communicate [are] studiously avoided” (The First Decade). The “distant lands of adventure, America’s past, fantasy, and the future” no longer seem so distant. The power of the Disney parks to move and inspire cannot be underestimated: What other man-made structures pull at the heartstrings of so many people worldwide as those created by Disney? The Magic Kingdom’s signature Hub must be restored to its original warmth and integrity in order to fulfill Walt’s vision of parks that grow more beautiful with each passing year. The de-forestation of the Hub is another example of Entertainment's extended control over the Magic Kingdom. They insisted that the hub be shorn of trees and planters in 2005 to "improve sightlines" for Cinderellabration, their huge, boring flop. Recently they constructed stages in Tomorrowland and Adventureland without consulting WDI first. The Tomorrowland stage is a somewhat ill fit and the Adventureland stage was built with no input from engineering, who would've advised against using that particular type of wood in the construction of the stage and possibly saved a performer's life. Now, Entertainment is stuck with a stage in Tomorrowland with no show, a show in Adventureland with a stage they can't use, and a pending absorption into WDI to better monitor their conduct. A division with much more money than any other in the parks, their reach extends their role. They really are one of the holy terrors of WDW internal politics. Your discussion is spot on! Great detail. I hope everything turns out to our highest expectations. Foxxfur, what are your thoughts on the new TTA narration? I'm with you Foxx on this, it has the makings of a winner, done right as suggested. I do wonder.. the layout seems so intimate with all that's planned, will reservations be needed at the meet and greets? Its hard to imagine them living to full their potential without, certainly with the dinning aspects involved. I've already heard grumblings posted about traffic flow. Foxxfur, I'm sure I don't need to remind you that Thunder Mesa was also publicized and promoted for years at Exposition Hall. I fear I'm as cynical as ever regarding the proposed expansion. Outstanding dialog. Keep up the great work - it's appreciated. Foxxfur, I love to hear from you, keep writing!